Just click and send this Birthday Essential Cookies N Chocolate Gift Hamper conveying the warmth of your love to your lovely relatives residing far away. 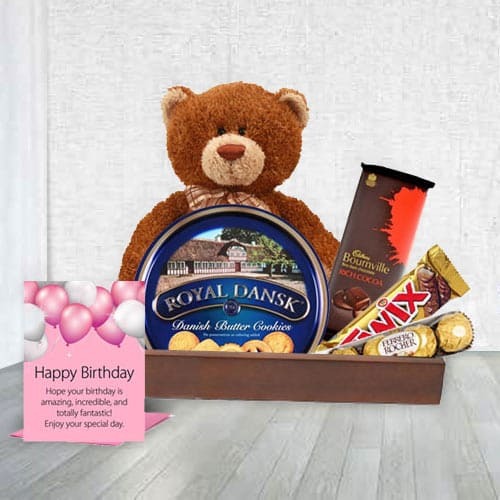 Make Birthday extra special with this celebratory gift consisting of Brown color Teddy, Cadbury Bournville, Danish Butter Cookies, 4pcs Ferrero Rocher, Twix and Birthday Card. This lavish treat is presented in a Wooden Tray.